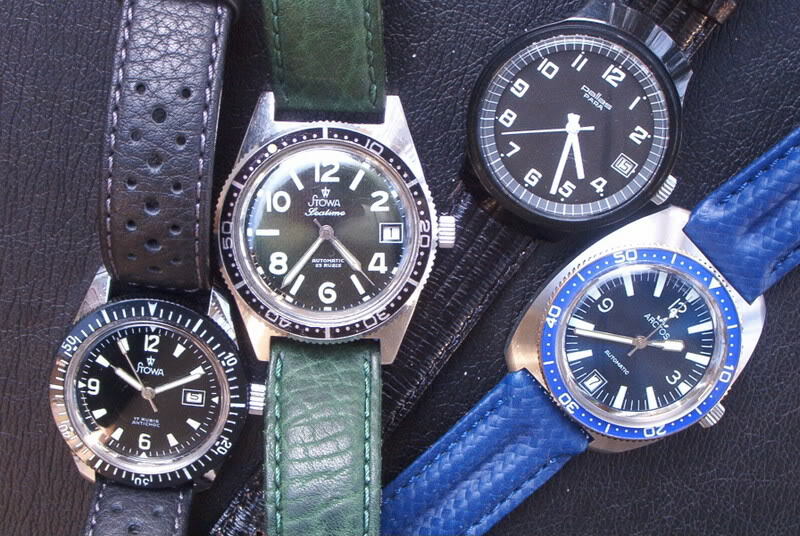 Once upon a time there have been a lot of watch manufacturers in the Pforzheim area known as Stowa (Walter Storz), PaRa (Paul Raff), Arctos, Hugo Weinmann (brand: Exquisit), Ormo and others. In 1970 most of them joined the Pallas Deutsche Uhren-Kooperation (Pallas German Watch Cooperation). Paul Raff was one of the men who founded Pallas. Somehow a new marketing strategy in 1970 by using synergetic effects - that´s what it is called nowadays. (So it is quite possible to fetch a Stowa Pallas or Pallas Stowa or just a Pallas on ebay or elsewhere). The Parat slogan (rime) was: "Immer pünktlich, früh und spat, mit der Armbanduhr Parat." (a translation would be: Always on time, early (in the morning) or late (in the evening) with a Parat wrist watch). Already in 1949 (after WW II) a "Deutsche Uhrenkooperation" (German Watch Cooperation) was founded by Philipp Weber under the brandname PARAT. There isn´t much to read about the Parat Cooperation but from what I could find out the Arctos Uhrenfabrik Philipp Weber, Berg Uhrenfabrik, Wilhelm Beutter, Osco Uhrenfabrik, Otto Schlund (brand was currently re-launched) and Stowa joined this co-op. PUW stands for Pforzheimer Uhrenwerke (Pforzheim Watch Movements or Pforzheim Ebauches). PUW movements have been very popular in from the 60ties to the 70ties and I think they are worth to be colected (just as a witness of time). The "Arctos Uhrenfabrik" was founded in Pforzheim in 1923 by Philipp Weber (1890 - 1962) and Jakob Aeschbach and first was named Weber & Aeschbach. In 1928 already 260 movements (pocket and wrist watches) have been produced per day. After WW II the brand´s name changed into Arctos Uhrenfabrik Philipp Weber. Later Arctos was known as an official suplier to the "Bundeswehr". The re-launched "Arctos" of our days is quite different to the "Arctos" of those days and –afaik- isn´t made in Pforzheim any more.